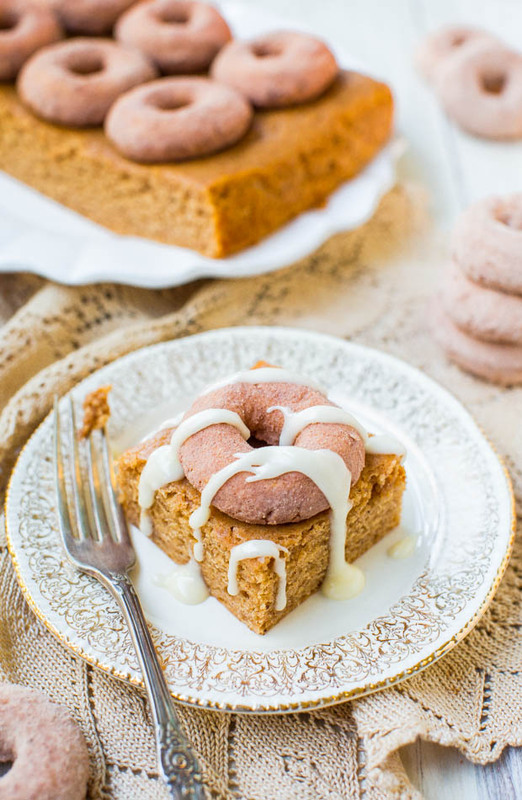 Mini donuts or coffee cake for breakfast? Hmmm, such a hard choice. I decided not to choose and had a two-for-one deal via this cake. 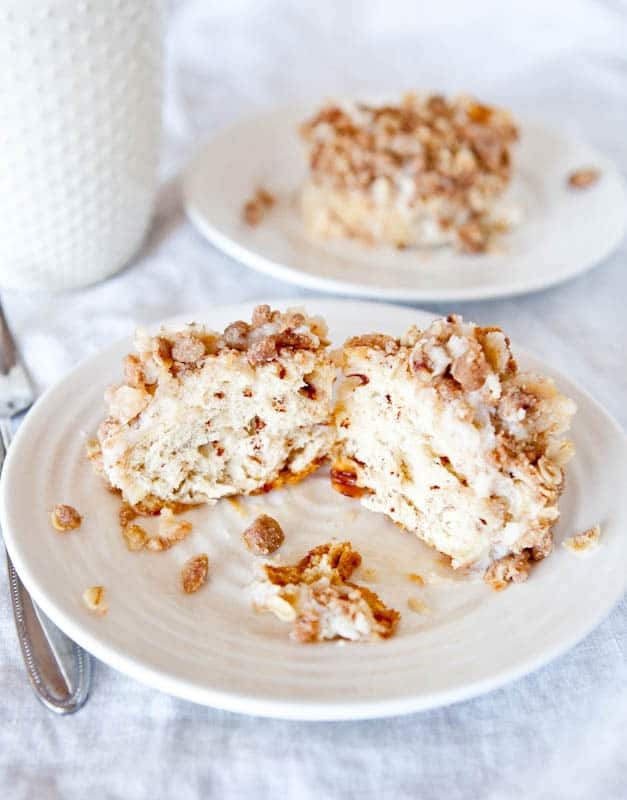 It’s a soft, moist, buttery tasting cake with notes of cinnamon and reminds me of snickerdoodle cookies, and I love snickerdoodles. I made the cake using my favorite foolproof, one-bowl, easy cake base. It comes together with a whisk, no mixer needed, and is simple enough to be made at a moment’s notice. I loathe dry cake, and used three tricks to keep it super soft, moist, and tender: Buttermilk, sour cream (or Greek yogurt), and oil. 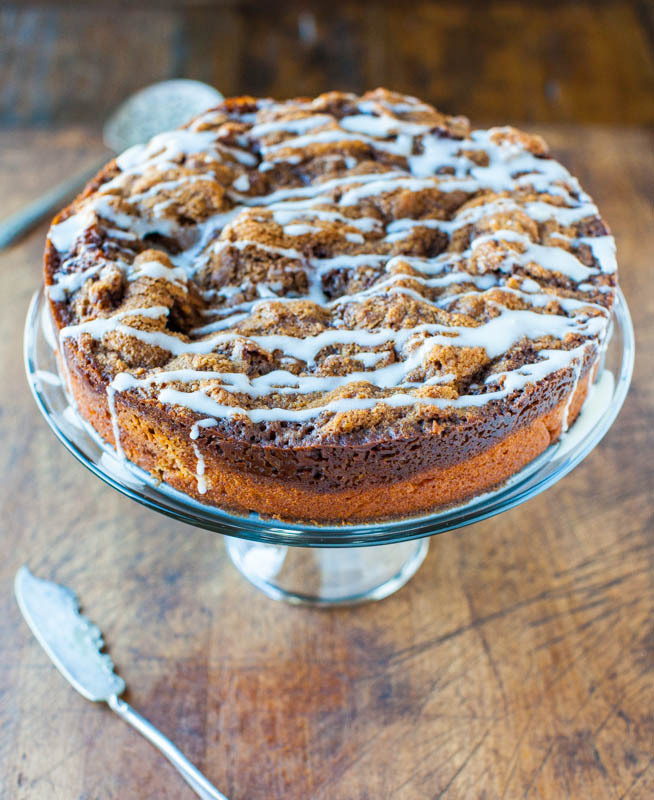 To make sure the cake had flavors similar to snickerdoodle cookies, I used one tablespoon cinnamon, a pinch of nutmeg, and sour cream for just a slight tang. Combined, they help create a snickerdoodle flavor profile. Bake the cake for about 25 minutes, or until just done. Just long enough that the center is set and a toothpick comes out clean or with a few moist crumbs. Then, top the cake with 9 mini donuts. 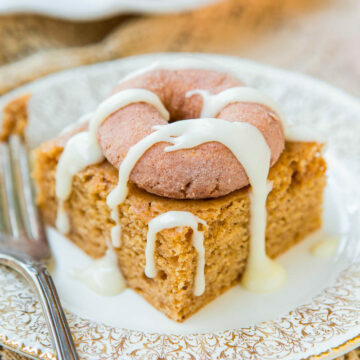 I used Entenmann’s Cinnamon Pop’Ems because I didn’t feel like making donuts just to put on a cake. 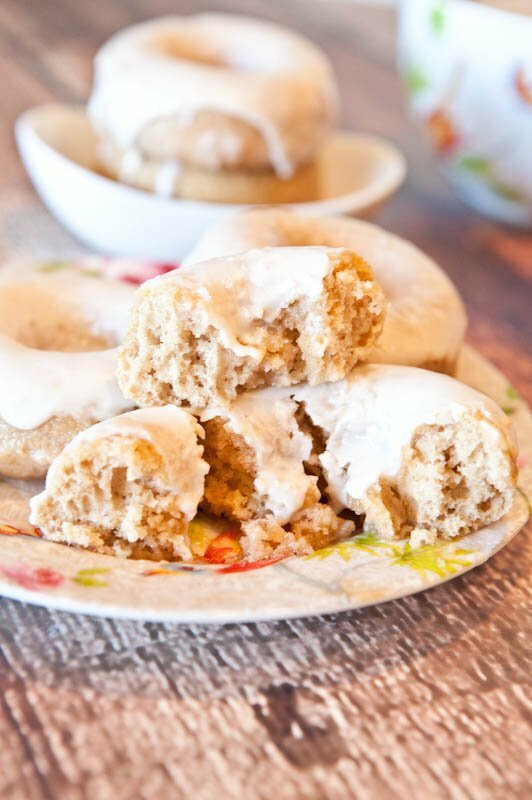 If you’re up for more work than I was, use either the Baked Vanilla Donuts or Baked Cinnamon Bun Donuts recipe and bake them in a mini donut pan for about 7 minutes. 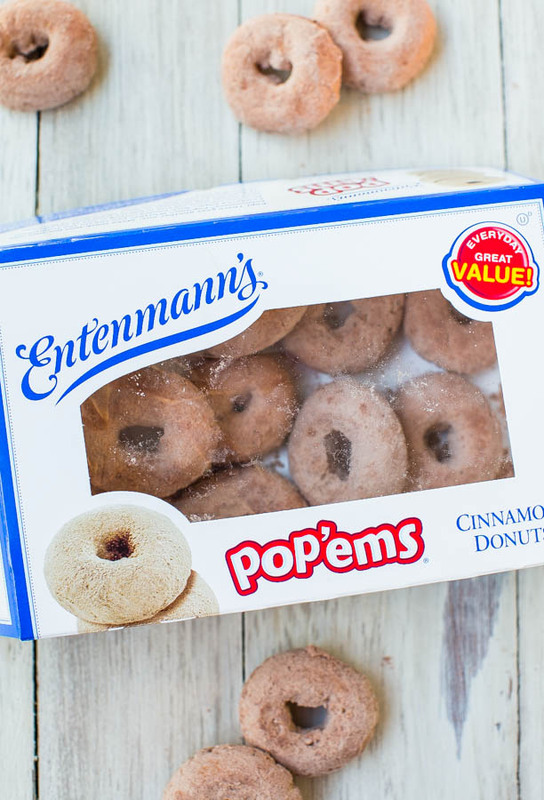 If you don’t have Entenmann’s, don’t worry. I would have preferred to use Krispy Kreme or Dunkin’ Donuts, but neither are easy to come by in my area. Use whatever donuts your local grocery store bakery has, or use donut holes. Depending on how big they are, you may want to cut them in half so it doesn’t look like baseballs are on top of your cake. 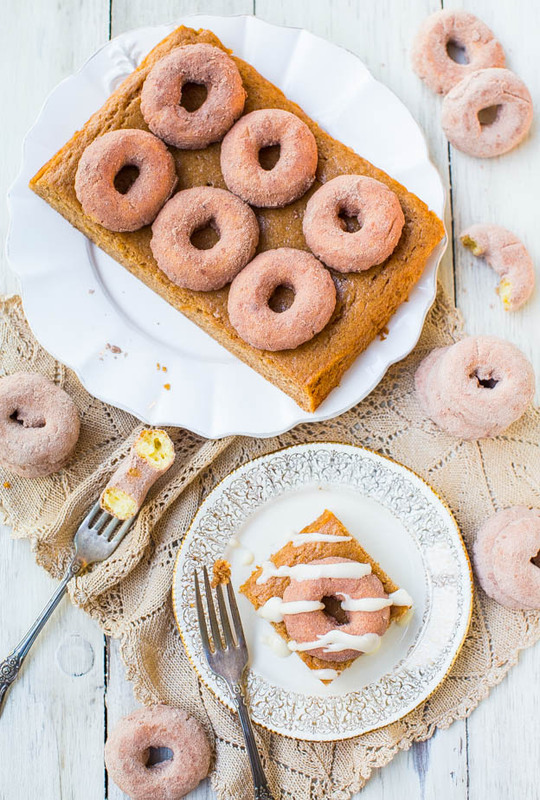 Bake the cake for about 2 minutes with the donuts on top. It helps the donuts and cake meld into one, so they don’t slip around. It also helps flavors marry when things are baked together, even briefly. 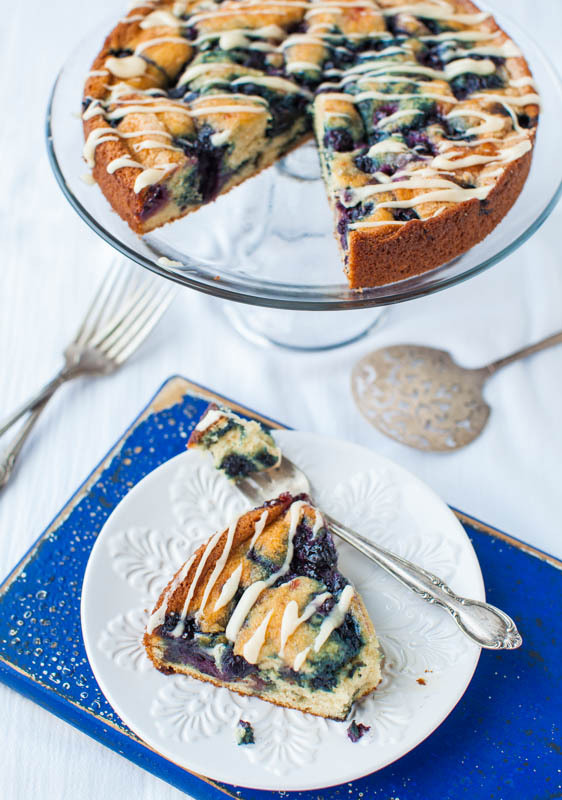 I glazed the cake with a simple melted butter and confectioners’ sugar glaze. 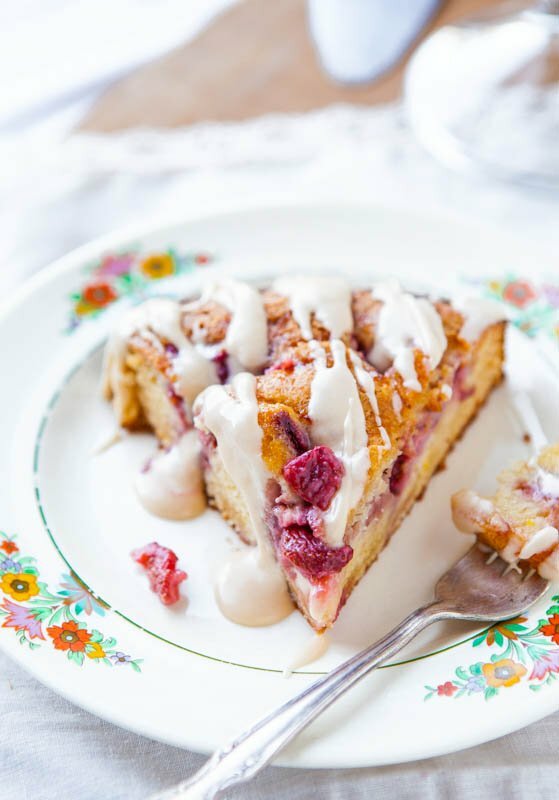 If you’re not going to serve or need the whole cake at once, you may wish to just glaze the portion you need. The cake is springy, bouncy, and very moist, with just enough density to give it tooth-sinking heft. It’s just sweet enough, but not overly so, and has plenty of cinnamon pop and snickerdoodle flavor. 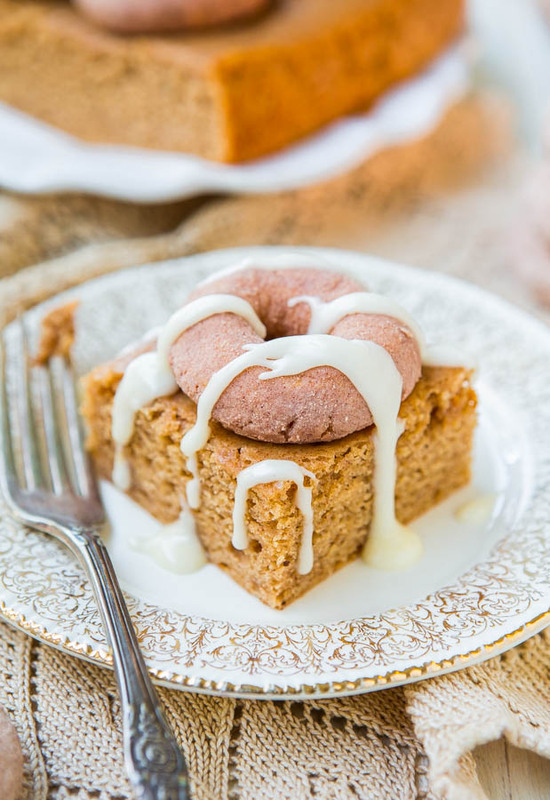 The cinnamon-coated cake donuts are what you expect bakery cake donuts or donut holes to taste like. They have huge nostalgia factor for me and remind me of being a kid and a big treat was my mom buying donuts from a bakery. She was a scratch baker with everything except donuts. 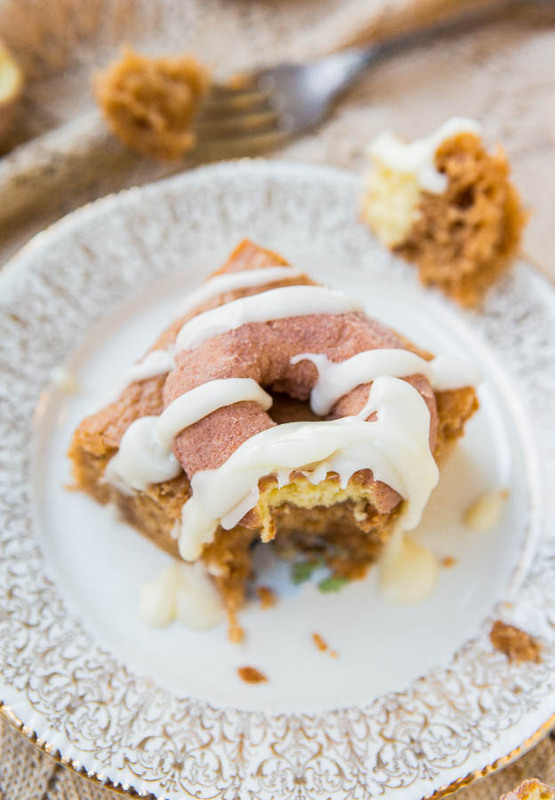 The combination of the cake, the mini donuts, and the glaze, all in one bite is dreamy. And I didn’t even have to choose between cake or donuts. 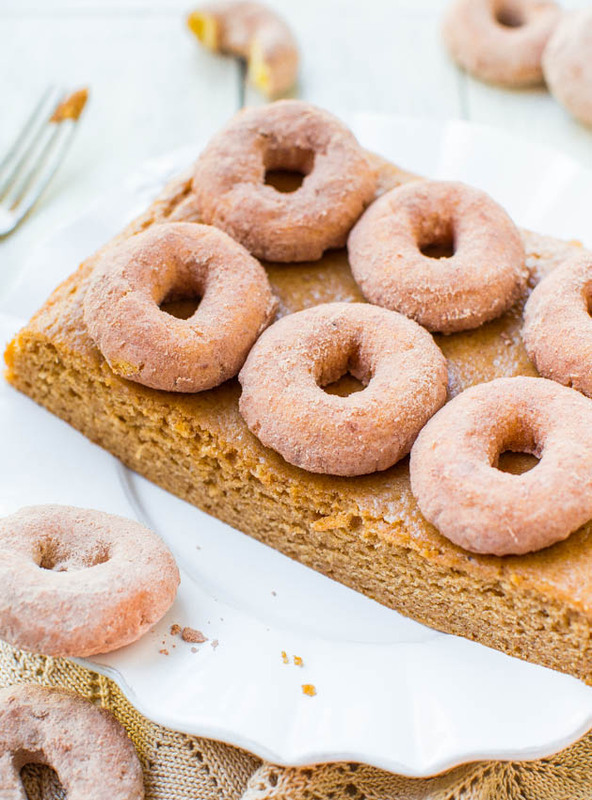 You don’t have to choose between donuts or coffee cake with this recipe – you can have both. The cake is springy, bouncy, and very moist, with just enough density to give it tooth-sinking heft. It’s just sweet enough, but not overly so, and has plenty of cinnamon pop and snickerdoodle flavor. I made the cake using my favorite foolproof, one-bowl, easy cake base. 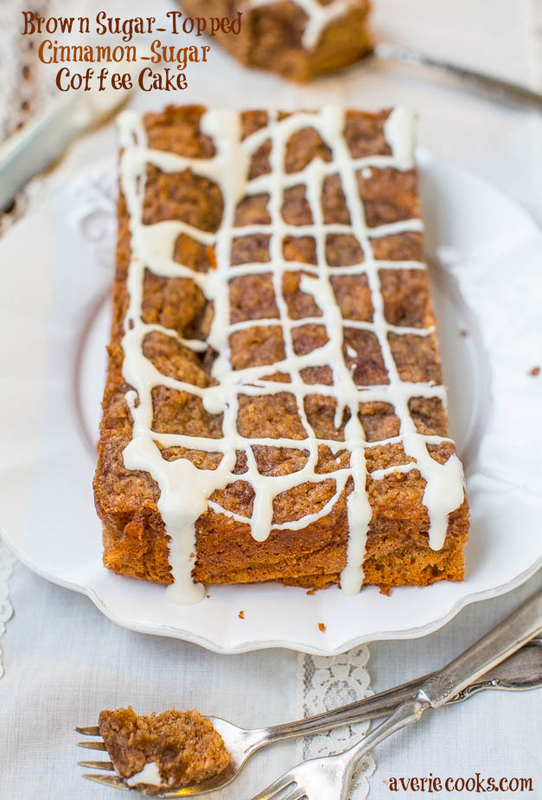 It comes together with a whisk, no mixer needed. I loathe dry cake, and used three tricks to keep it super soft, moist, and tender: Buttermilk, sour cream (or Greek yogurt), and oil. I used storebought mini donuts (Entenmann’s) but Krispy Kreme, Dunkin’ Donuts, grocery store bakery donuts (or donut holes) will work just fine. 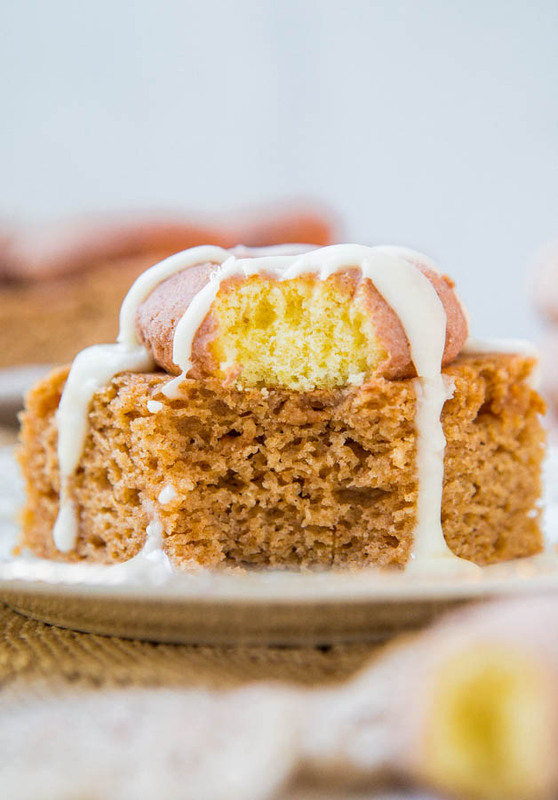 The combination of the soft snickerdoodle cake, the cinnamon-sugary mini donuts, and the buttery glaze, all in one bite makes me happy I don’t have to choose between favorites. Bake for about 25 minutes, or until a toothpick inserted in the center comes out clean or with a few moist crumbs, but no batter. Watch your cake, not the clock, and always bake until done, whatever that means in your climate and oven, given the ingredients you used. Remove pan from oven and carefully place 9 mini donuts on the surface, spaced uniformly and evenly. 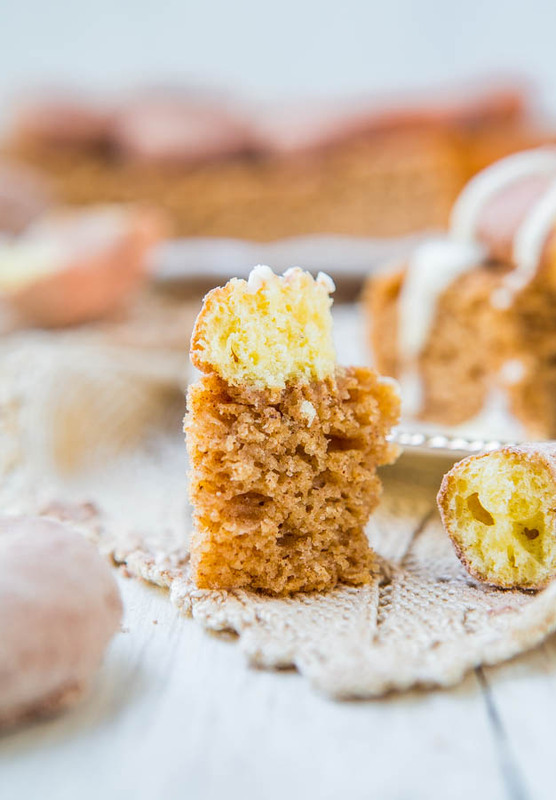 Using your palm or fingertips, lightly smoosh donuts onto the cake to help them stick. Return pan to over and bake for about 2 more minutes. This helps set donuts into the cake so they won’t slide around. 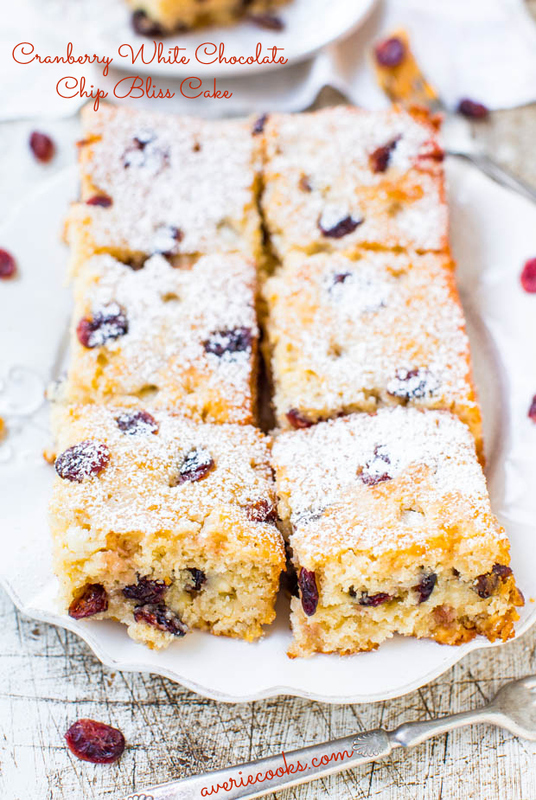 Remove pan from oven and place on a wire rack and allow cake to cool for at least 20 minutes in pan before optionally glazing. While cake cooks, makes the glaze. Glaze – In a small microwave-safe bowl, add the butter and heat on high power to melt, about 45 seconds. Add about 1 heaping cup confectioners’ sugar and whisk until smooth. Depending on desired consistency, continue to add sugar until desired consistency is reached. If you accidentally add too much, add a splash of cream or milk to thin. 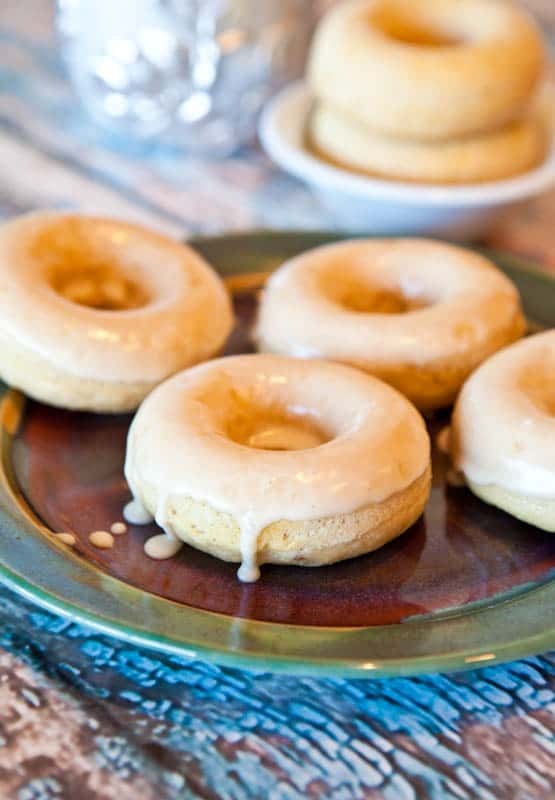 Alternatively, try buttery vanilla glaze or browned butter glaze. 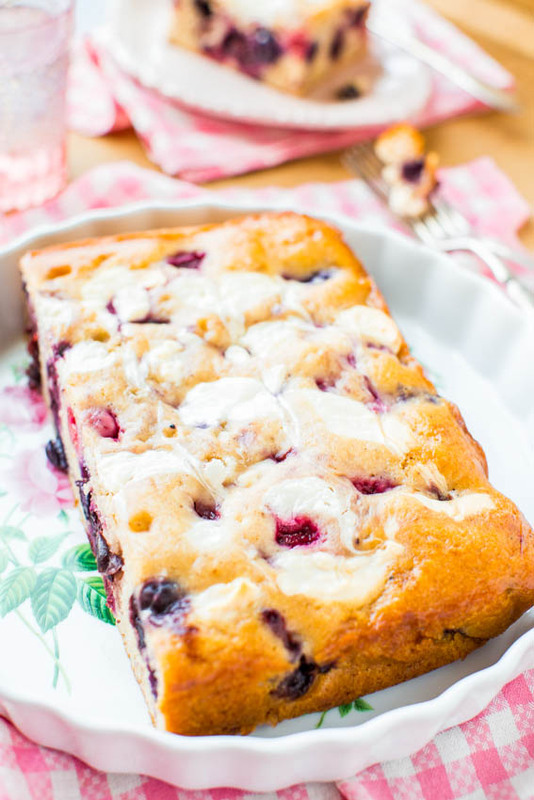 I just made this cake and its heavenly! I was moaning with every forkful I take. Your weren’t kidding when you said that its super moist, fluffy and springy. 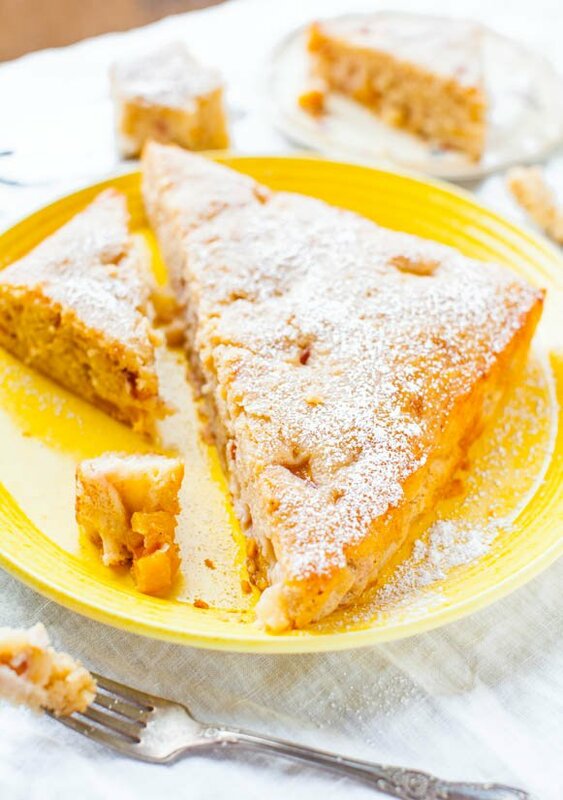 To be honest, I was skeptical that with this amount of wet ingredients, the cake might feel too moist, almost wet and gummy, but it had just the right amount of moisture and not dense in the least. I see myself playing around with this cake so much in the future. Might I ask if you ever tried making it using butter instead of oil? I wanna try a vanilla version of the cake, but I want some buttery tones to shine through. With the cinnamon version, I didn’t miss the butter one bit because the copious amount of cinnamon and nutmeg make up for it. Thanks for the great recipe. I also recently made your M&M’s chocolate chip cookies with the pudding, and it was the best M&M cookies I’ve ever tasted! I’ve made this cake so many different ways. 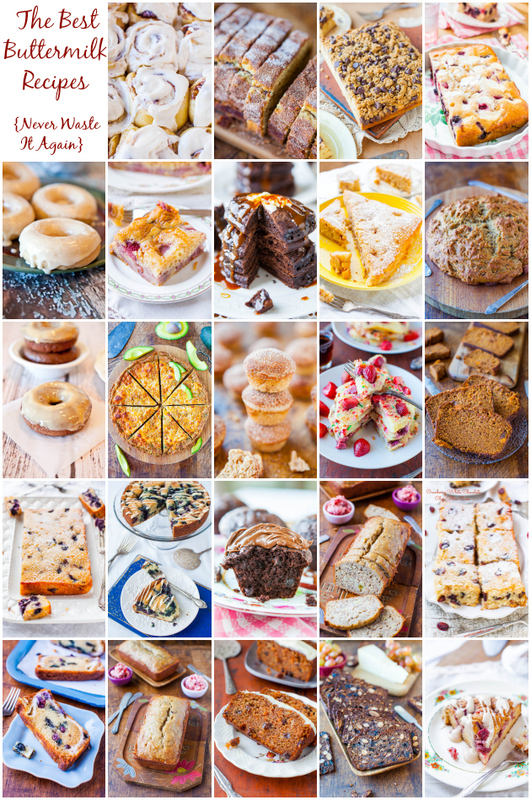 Almost all the related recipes that I linked in the post are a version of the same cake base, just slight tweaks to spices. Honestly I wouldn’t use butter even if you want a buttery cake, paradoxical but true. Just skip the cinnamon and other spices, use the oil, add extra vanilla, and you’re set. 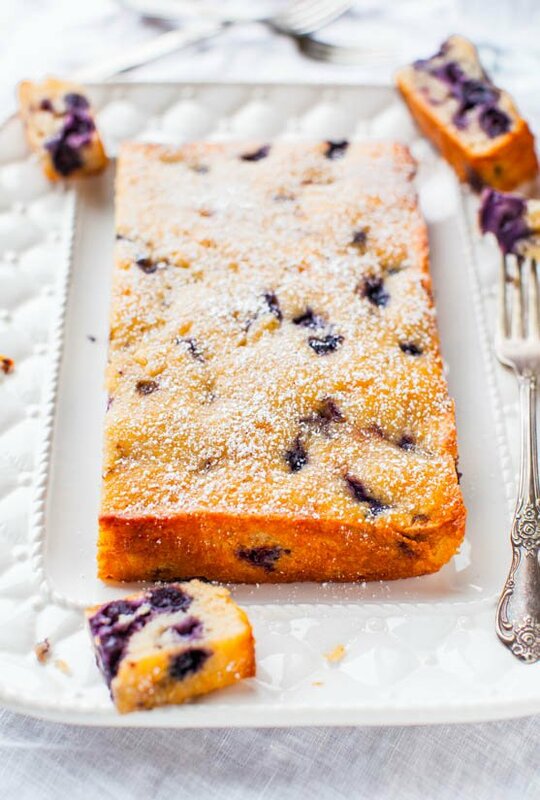 If you find it’s not buttery enough, you could try baking it w/ butter again BUT butter does not make cakes moist like oil does and I find it makes the crumb drier, flakier, and the cake is more prone to ‘crisping up’ like what would happen if you roasted vegetables with butter, they crisp up. LMK how it goes. Thanks for trying the M&M cookies with pudding & glad they’re the best you’ve ever had! Thank you so much for the very thorough reply. Your Quadruple Chocolate Pudding Cookies are now on my on my to-bake-list. Drooling over it!